You are currently browsing the tag archive for the ‘Ben Sharpsteen’ tag. 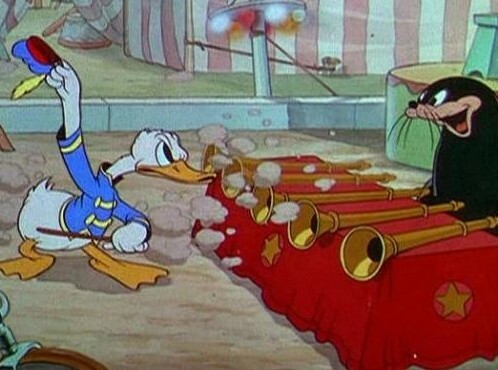 After co-starring with Pluto in ‘Donald and Pluto‘ (1936), Donald really comes to his own in ‘Don Donald’. 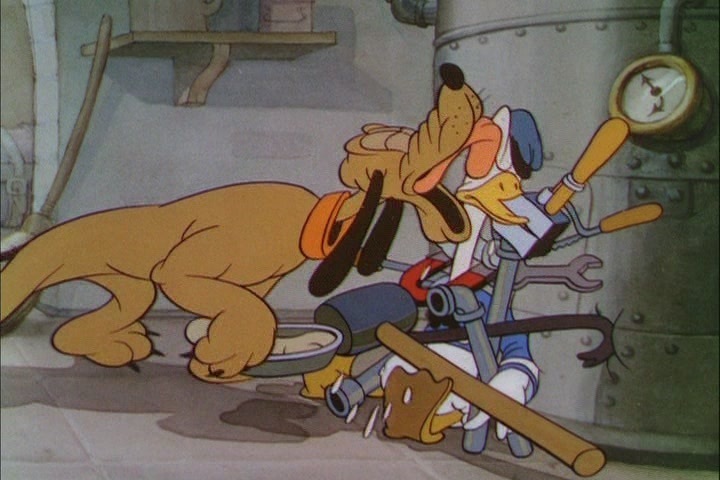 In this cartoon he only shares screen time with a new character, Donna Duck, a predecessor of Daisy with a temper that matches Donald’s own. In this film, we watch Donald in a Mexican setting featuring a surprisingly Krazy Kat-like palm in the background. He wears a large sombrero and tries to woo Donna, but his donkey spoils his efforts. Donald trades his donkey for a car (the small red car we would become so familiar with). The car makes a deep impression on Donna, and both go for a ride. 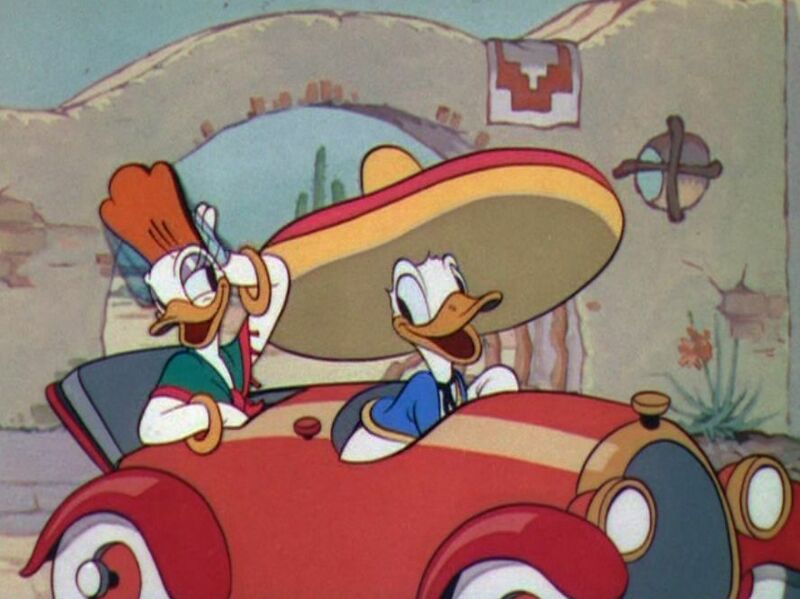 The animation of the car ride is a great showcase of animation of speed, while the hilarious sequence in which Donald tries to restart the motor again is a wonderful example of rubbery animation. The film ends marvelously, when Donna produces a unicycle out of her handbag and rides off into the distance. But the whole film is one of sheer delight and one of the classics of the 1930s. 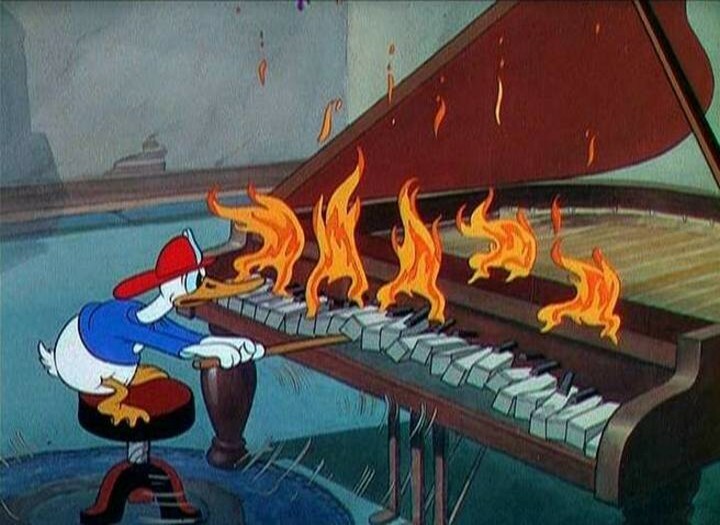 Despite Mickey’s absence, ‘Don Donald’ is still part of the Mickey Mouse series. Only with ‘Donald’s Ostrich‘ from December 1937 Donald would get his own series. 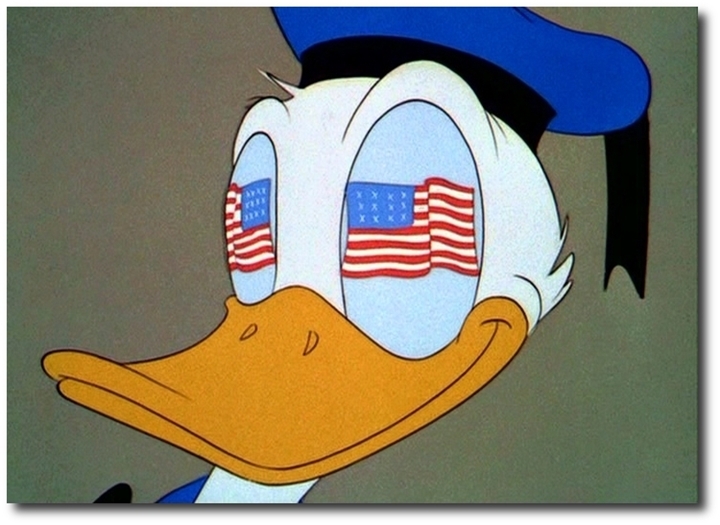 When the United States were forced into the war themselves, the government asked Disney to make a short to make the American citizens fill in their income tax forms in time. Disney gave them his biggest star of that time, Donald Duck, to play the everyman. The government was not impressed until the taxes came rolling in after the film was screened in cinemas. In contrast to Disney’s earlier propaganda films for the Canadian government, this film uses entirely new animation, directed by Wilfred Jackson, and produced in the ridiculously short time period of a single month. 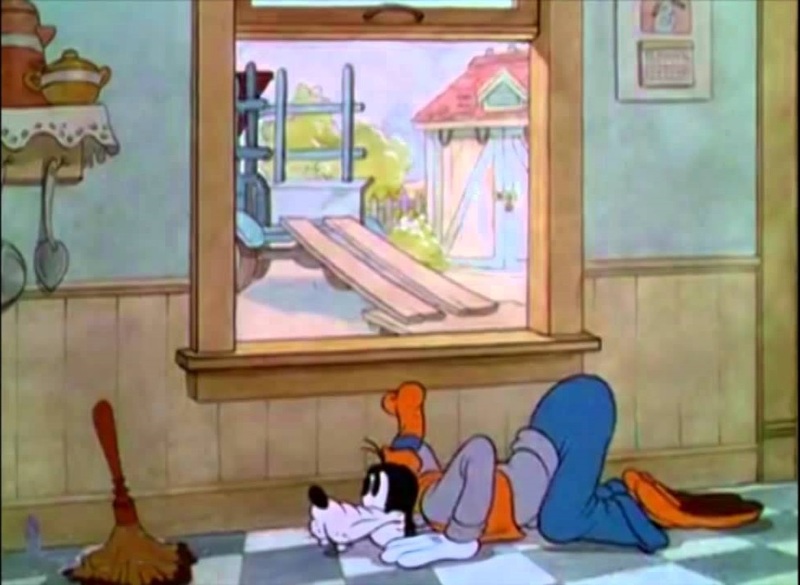 The short opens with Donald dancing to the energetic title song, which is sung by Cliff Edwards, the voice of Jiminy Cricket in ‘Pinocchio‘ (1940). The song is played on a slightly anthropomorphised radio. The radio then asks Donald if he wants to do his part for the country and Donald is growing more and more enthusiastic, until the radio reveals he has to pay his income tax. The radio has to persuade Donald once again, who grows enthusiastic again to the strong slogan ‘Taxes to beat the axis’ (with the axis referring to the Axis powers: Germany, Italy and Japan). The film further explains the public how to fill in a new, simplified form, using an anthropomorphized pen, bottle of ink and blotter. 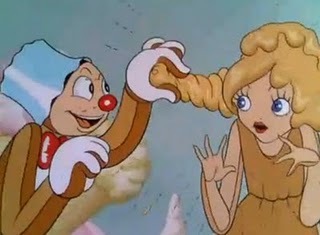 Like the shorts Disney made earlier for the Canadian government (e.g. ‘The Thrifty Pig‘ and ‘7 Wise Dwarfs‘), the second half (directed by Ben Sharpsteen) consists of very limited and highly propagandistic animation with grim images of factories, guns, planes, war ships and tanks, while an intense narrator repeats the intoxicating mantra of ‘taxes to beat the axis’. When he comes to the propagandist climax, the sentence “to beat to earth the evil destroyer of freedom and piece”, we watch a horrifying towering monster-like machine depicting the Nazi aggressor. This mechanical monster is defeated and makes place for a patriotic end shot with clouds resembling the American flag, tanks and guns rolling and planes flying accompanied by a heroic hymn, while the narrator tells us that “this is our fight”. It’s important to note that the film goes at lengths to dehumanize the enemy. The average tax payer was not to help to kill people, but to destroy “the enemy”, in this case a vague mechanical monster. Succeeding propaganda films often eschewed the idea that making war is killing people, with the propaganda feature ‘Victory through Air Power’ (1943) being the prime example. In case of “The New Spirit”, propaganda rarely was so obvious, but it works: after watching the picture I had its slogan in my head for days. Indeed, the film was so successful, that it got a follow-up the next year: ‘The Spirit of ’43‘. Arguably the most ridiculous of all war time propaganda cartoons, ‘Food Will Win the War’ tells us about the successes of American agriculture. A bombastic narrator makes all kinds of outrageous comparisons to illustrate the farmer’s huge production. Examples are baking all fruits of America into one big pie or frying all America’s meat on four Vesuvius volcanoes. The result is so absurd and its message so out to lunch that the short is actually great fun to watch. 4) The three little pigs leading an army of pigs. 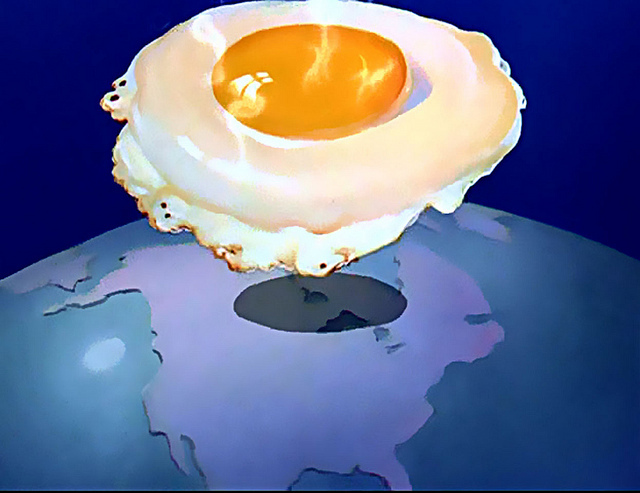 ‘Food Will Win the War’ was the last animated short directed by Ben Sharpsteen. In the 1940s he had moved more and more towards production. He would supervise the production of a.o. ‘Fun and Fancy Free‘ (1947), ‘Cinderella‘ (1950) and ‘Alice in Wonderland‘ (1951) before moving to live action, working on Disney’s True-Life Adventures (1948-1960). He retired in 1962. 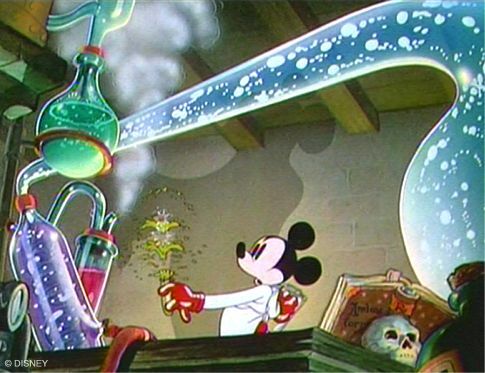 In the opening shot of ‘The Worm Turns’ we watch Mickey looking like an evil scientist, working on a potion that can give courage and power. He tries it on a fly caught in a spiderweb, on a mouse (the two different designs of mice in this film, with one being twenty times larger, is quite confusing!) 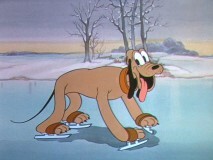 who is the victim of a cat, on the cat, who’s chased by Pluto, and on Pluto, who’s threatened by evil dog catcher Pete. The animation of the opening sequence is quite stunning, but the whole short fails to get funny. Hanna and Barbera would revisit the same idea in the similar ‘Dr. Jekyll and Mr. Mouse‘ (1947) with much better results.